During a House Oversight Committee hearing Thursday, Secretaries of State Kris Kobach from Kansas and Jon Husted of Ohio warned that a loophole in President Obama's executive action on illegal immigration could lead to millions of non-citizens obtaining the ability to vote in U.S. elections. "I want to bring to your attention my concern that the President’s recent Immigration Accountability Executive Actions will make it more difficult for elections officials to determine if all voters meet the primary standard for voting – U.S. citizenship. I am not here to debate immigration policy or the President’s executive actions. However, I am here to emphatically say that we cannot follow both the federal law and the executive action and ensure the integrity of the elections process without further assistance from Congress and the Obama administration," Husted said in prepared testimony. "For an estimated four to five million non-citizens, the President’s executive actions provide access to Social Security numbers and driver’s licenses. These are the same documents that federal law requires the states to recognize as valid forms of identification for voter registration. Under federal law, anyone with a valid Social Security number or driver’s license number can register to vote, provided they attest that they are a U.S. citizen. However, there is no way for us to validate this citizenship statement, since under the executive actions previously undocumented non-citizens will have access to the same documents as U.S. citizens. The issue becomes especially complicated in states like Ohio where millions of dollars are spent on third - party voter registration drives where no election official would be present to make clear the eligibility requirements for voting." "Let me interject some perspective before I go further. It is not my belief that four to five million non- citizens are going to get on the voting rolls, nor is it my belief that third - party registration drive organizers are waiting to exploit a loophole in law. While I am committed to ensuring the security and integrity of elections in Ohio and throughout the country; it is important for us to recognize that people can sometimes sign documents – in this case a voter registration forms – without fully comprehending the rules and requirements," Husted continued. "Acknowledging that I do not expect this to be a systemic or widespread problem, we also cannot ignore that there are real electoral consequences. Presidential elections get the most attention, but every year there are thousands of state and local elections in Ohio, and in the last 15 months alone, 70 elections were decided by one vote or tie." Husted sent a letter to President Obama in January asking for the ability to access up-to-date and accurate Social Security number information to ensure non-citizens are not voting and to prevent illegal voter registration. "This would enable me and my counterparts in other states to prevent illegal registrations, and more importantly, reassure the public that steps have been taken to ensure only eligible voters are participating in federal, state and local elections," Husted said. 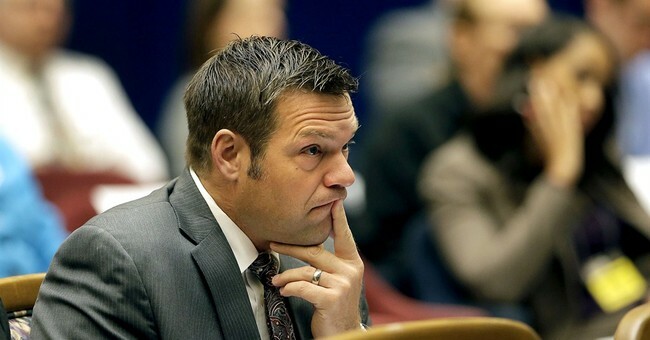 Kansas Secretary of State Kobach warned lawmakers about the threat illegal voting and registration from non-citizens poses to our electoral process. "The problem of aliens registering to vote is a massive one, nationwide. And I have seen it firsthand in Kansas. Because there is no way of scanning a state's voter rolls and identifying which of the registered voters are aliens, determining the exact number of aliens on the voter rolls in virtually impossible. But we know that the number is significant, because specific election episodes present evident of aliens voting and because we gain some information by matching driver's license databases against voter rolls," Kobach testified. "Based on the empirical evidence that I have seen as the Kansas Secretary of State, it is a certainty that the Administration's executive actions will result sin a large number of additional aliens registering to vote throughout the country, in violation of state and federal law. These are irreversible consequences, because once an alien registers to vote, it is virtually impossible to detect him and remove him from the list of registered voters." A Cooperative Congressional Election Study released in October 2014 found, "more than 14 percent of non-citizens in both the 2008 and 2010 samples indicated that they were registered to vote. Furthermore, some of these non-citizens voted. Our best guess, based upon extrapolations from the portion of the sample with a verified vote, is that 6.4 percent of non-citizens voted in 2008 and 2.2 percent of non-citizens voted in 2010." Lawmakers on Capitol Hill have vowed to further look into this problem as they try to find ways to defund President Obama's executive amnesty.